Occasionally, individual performances will over shadow the overall outcome of the game. In Wednesday night's case, in a game where there were plenty of player of the week candidates on both teams, Ryan Barber of The Beer Leaguered put his stamp on the game and nearly sparked a 2-out rally in the final inning. Channeling his inner right-handed Charlie Blackmon, Ryan harnessed the power of the beard and crushed an absolute shot that resulted in a 2-out grand slam, landing in the skate/bike park at Bobby Morris Playfield. It doesn't happen often, but when someone clears this fence then this ball probably travels out of a good majority of Major League stadiums. 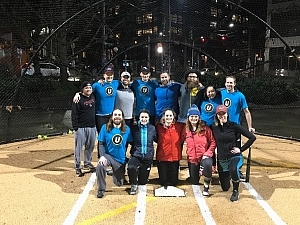 However, the estimated 330-foot shot was unfortunately not enough to bring The Beer Leaguered back to win in the final inning as the Lions played a great game from inning 1 throughout. Congratulations to the Lions for making the championship game and shout out to Ryan for blasting off!